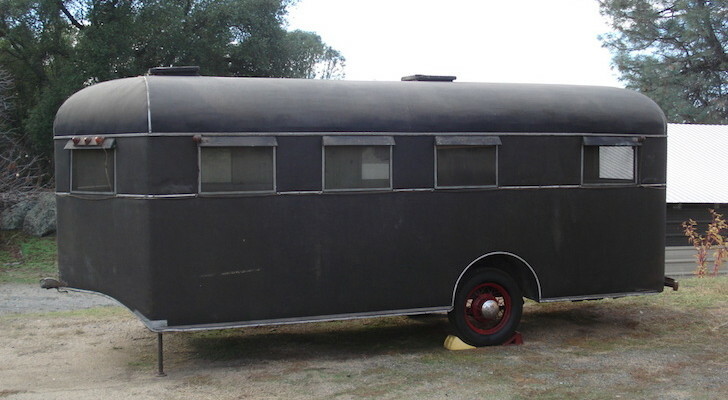 This truck camper is a work of art. It's got solar power, a refrigerator, grill, and is so well insulated you could take it to Antarctica. 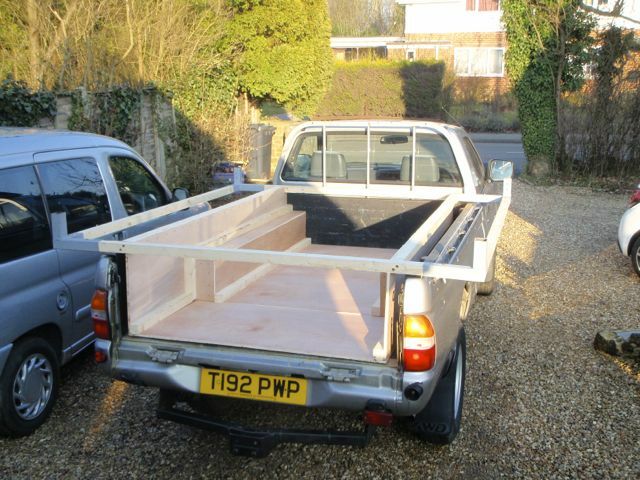 Handmade Matt bills himself as a Camper Van, Cabin and Tiny Home Specialist. 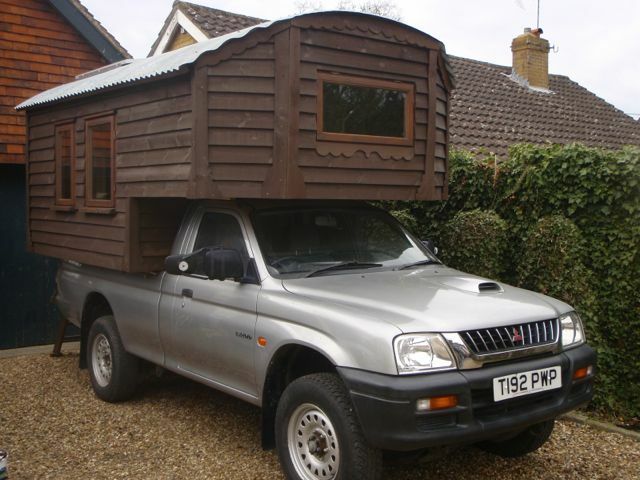 I don’t see a lot of homemade truck campers, so it’s a real pleasure to get an up-close and personal tour of one. 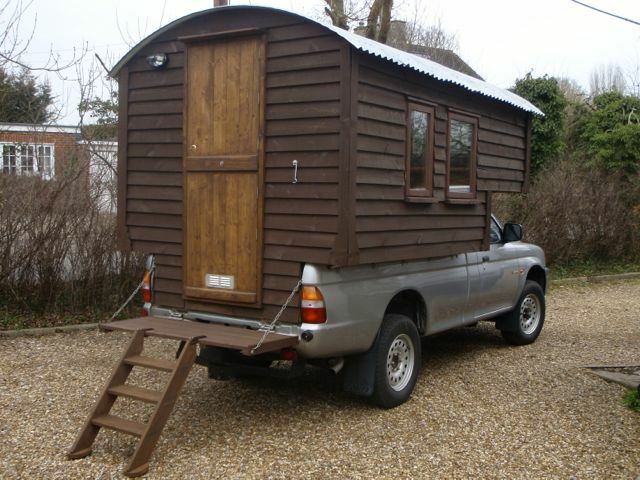 Matt lives in the UK, and they call truck campers there ‘demountable campers’. 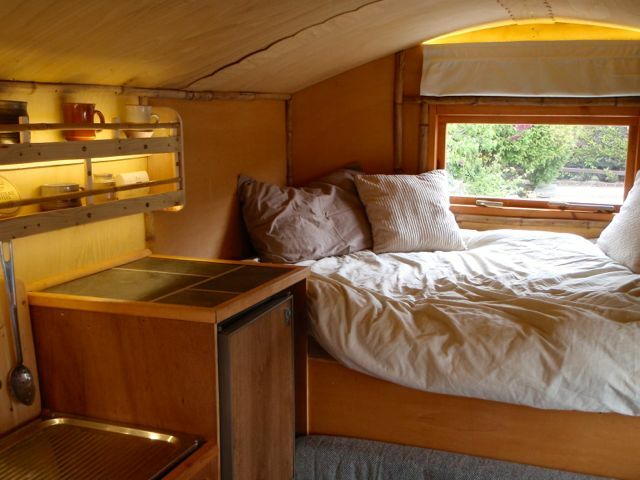 I love how this camper has a lot of insulation. 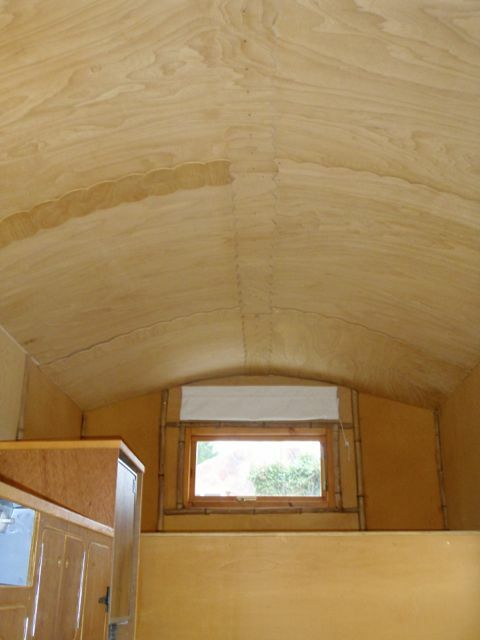 It’s difficult to add insulation to factory-produced truck campers, and Matt did a great job of making his unusually well-insulated. 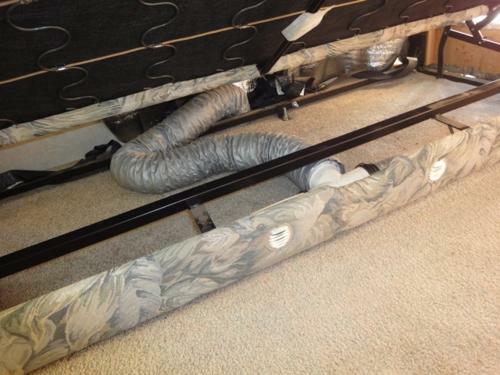 He even made sure to add extra insulation to the area underneath the cab-over bed. Matt said his vision for the project was to, “…create a traditional looking timber removable camper unit with lots of modern comforts”. 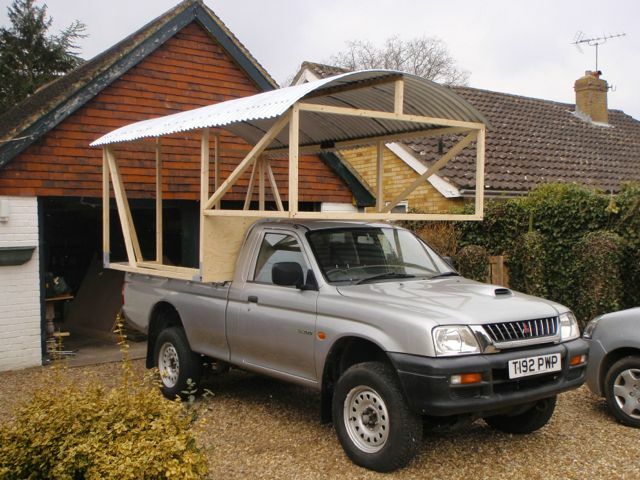 It takes less than twenty minutes for him to to mount or dismount the camper from his Mitsubishi L200 diesel pickup truck, which he bought specifically for this project. 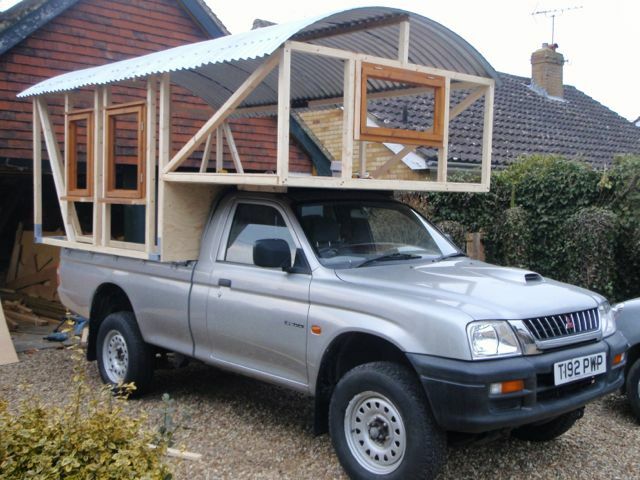 Matt’s homemade truck camper mounted on his Mitsubishi L200 diesel truck. This is the only drawing Matt made of the design. The rest came from his own creative inspiration as he went along! 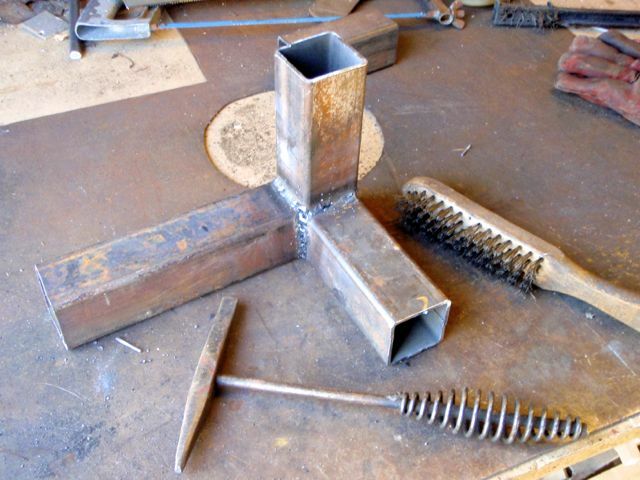 He made these jack mounts out of steel. 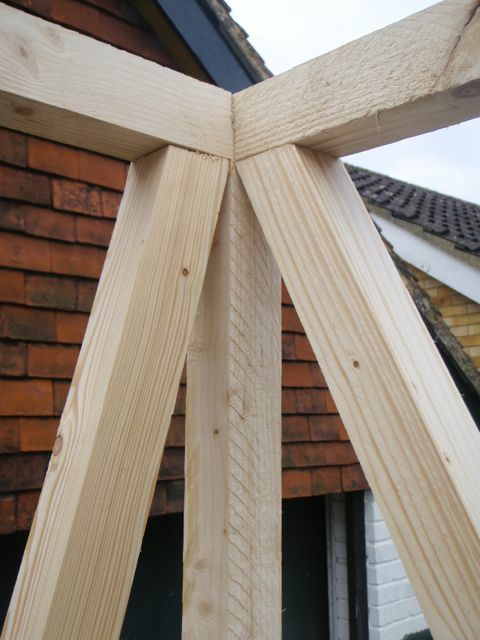 Being in the UK, they fit 50 mm wood framing. All cleaned up after primer and paint with timber fitted. 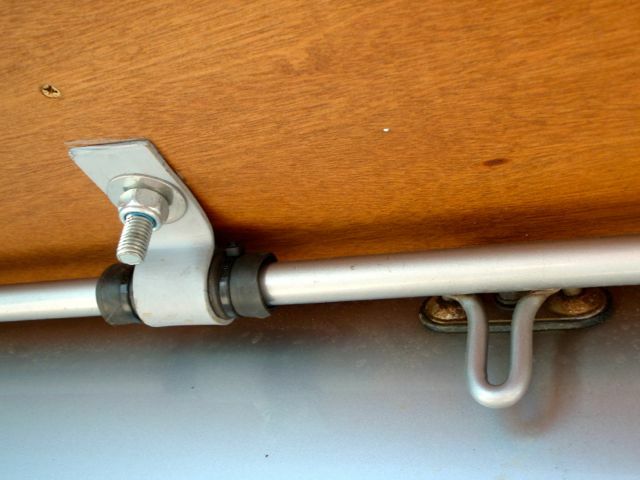 The jack points overhang the bed for easy mounting and dismounting of the camper. Matt boxed out the wheel wells in the floor, and immediately started to build the frame and roof. He started with the roof first so he’d have some shelter during the rest of the build. Matt’s farmer friend has a machine from WWII that he used to bend the corrugated tin roof. Detail of the angled braces. 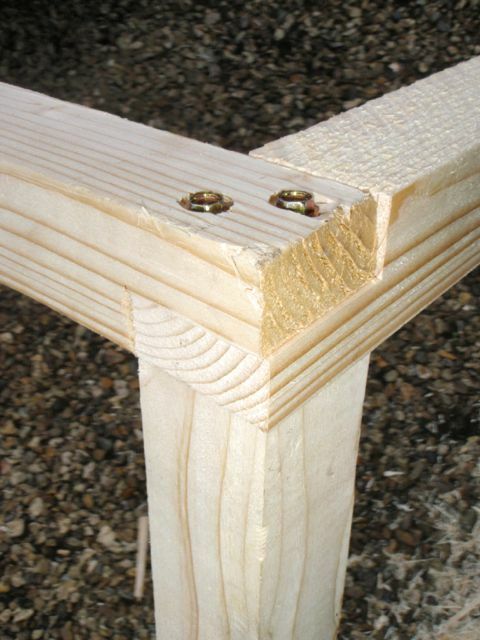 The interlocked wood and bolts make for a solid frame. 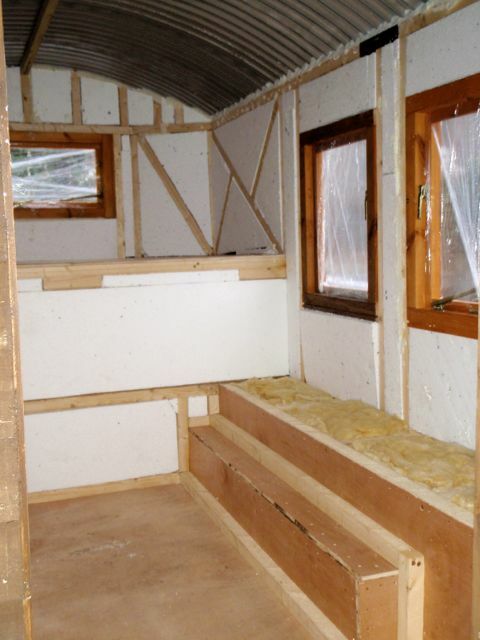 Matt added a lot of insulation to the over-cab portion of the camper. 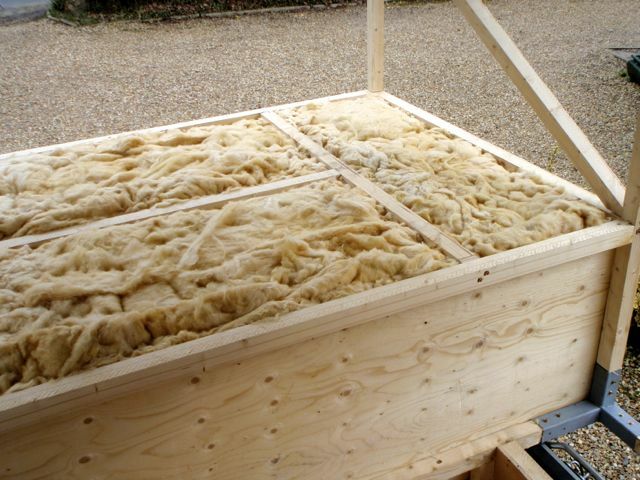 The bed sits atop this insulation. After installation of the salvaged window frames. 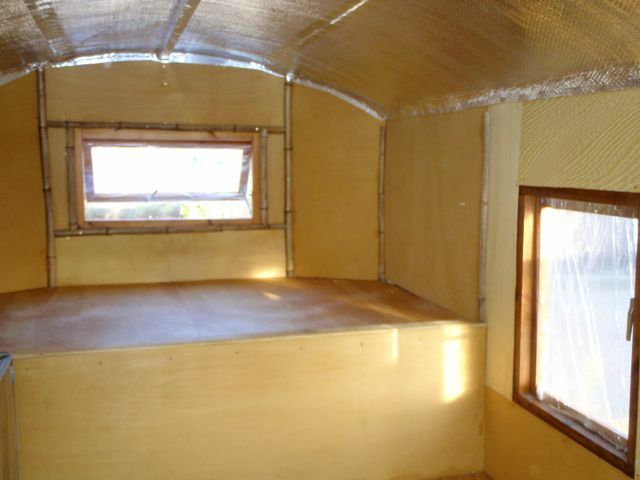 He wrapped the shell in recycled PVC sheathing to rain-proof the camper. 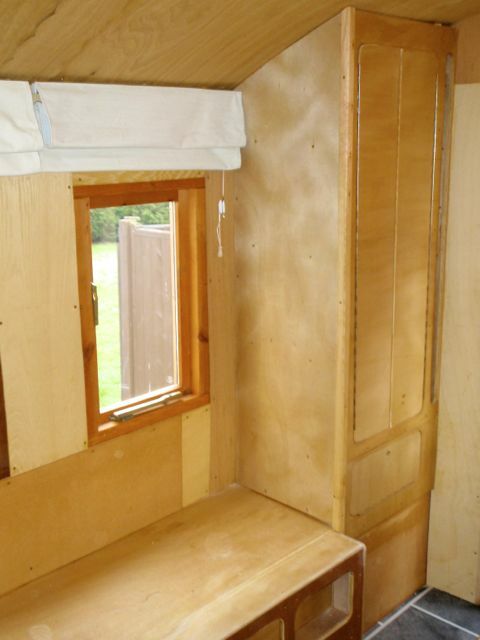 The siding is treated lumber that adds structural integrity to the camper as well as protection from the elements. Matt took great care to add 2 inches of insulation in between the framing. 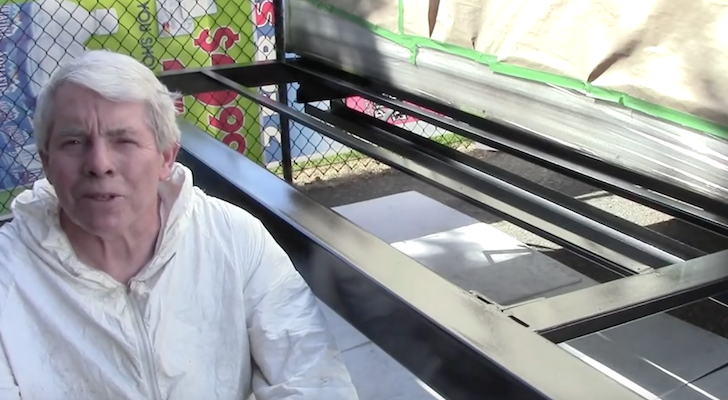 For the roof he used foil-lined air bubble sheathing to insulate and block moisture . It’s important to seal all seams with foil tape to prevent warm air from getting behind the insulation and causing condensation on the interior surface of the tin roof. 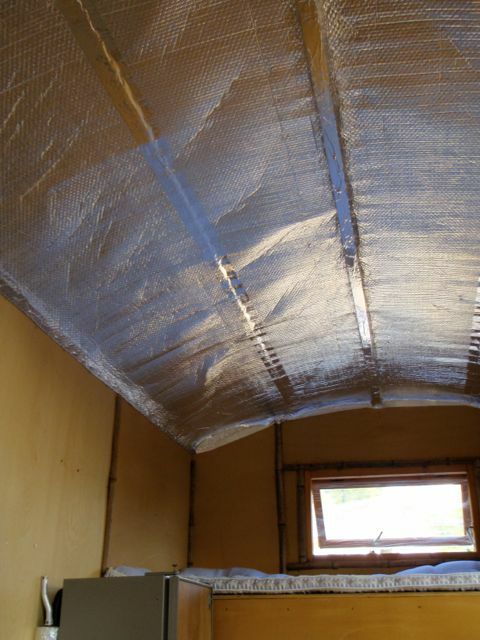 Celotex (rigid foam insulation) went on over the foil. Matt built a stable door for the rear entrance with a standard house lock for security. The top half of the door swings open for ventilation. 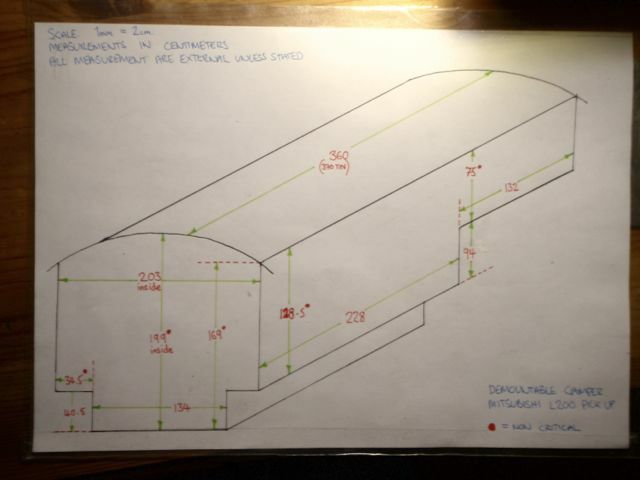 The inside was lined with only 1/8″ hardwood plywood to save on weight. Looks great though. Look at that grain in the ceiling and the bamboo trim! 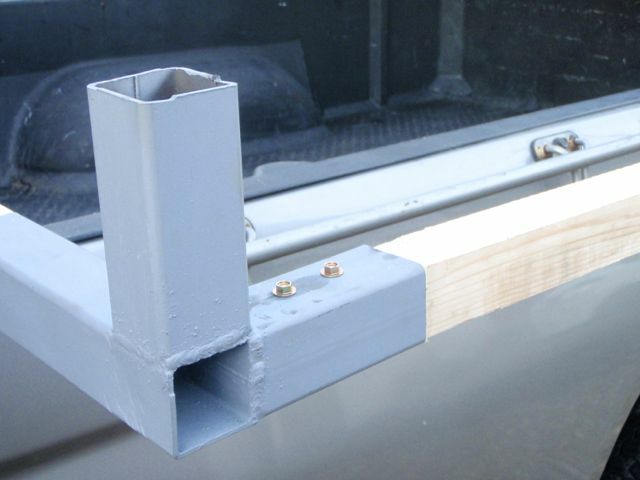 Matt made his own latches to keep the camper securely fastened to the truck. 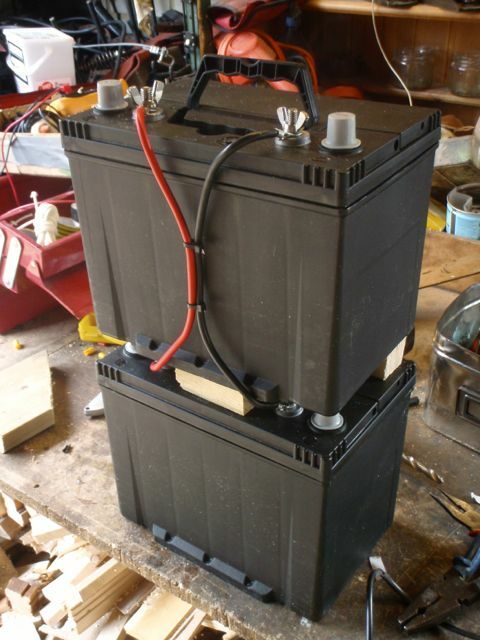 Two 85 amp deep cycle batteries power the electrical. The two solar panels on the roof send power to a charge controller in the cabin, and then on to the batteries. 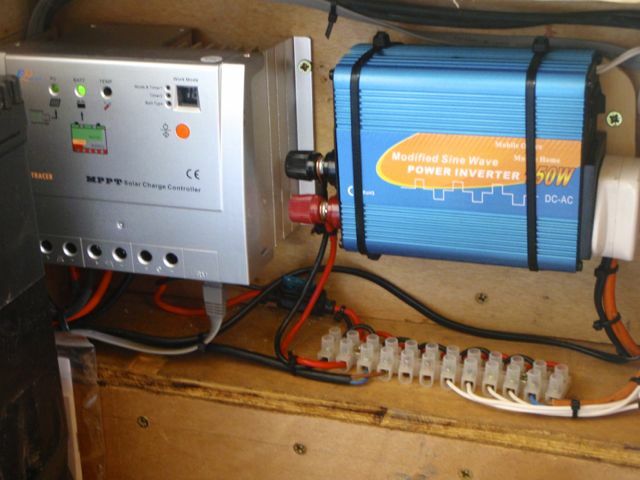 The charge controller on the left regulates the power provided by the solar panels. 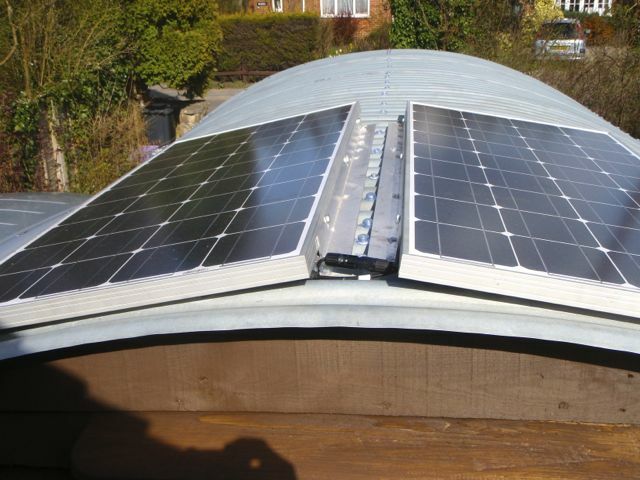 The power from the solar panels leads down to the silver box on the left. This is a charge controller. It monitors the PV (solar) power and the batteries status to deliver optimum charge characteristics and to avoid damaging over charge scenarios. It’s an MPPT controller (maximum power point tracking) which basically means it optimises the PV output voltage and amperage to deliver the maximum watts (power.) They are more expensive but will give you maybe 10% or more juice from your system. The blue box on the right is the inverter. This creates 240volts AC from the 12volts DC for running domestic appliances. There’s also an auxiliary charging circuit from the vehicles electric system. When the engine is running the auxiliary batteries in the camper unit are charged and the fridge is run. (The fridge uses a lot of electricity so when parked up camping it is run from the gas supply. Ironic, cooling from a flame… magic.) If the camper were to be in a guaranteed full summer sunny location the electric system could run the refrigeration but it would be quite taxing. 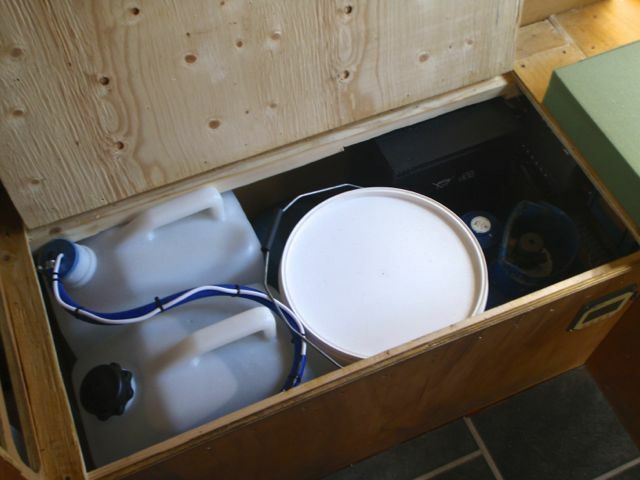 This is the storage area for water (13 gallons), 170 amp-hour 12 V batteries, 15 pounds of butane gas, and an emergency composting toilet. 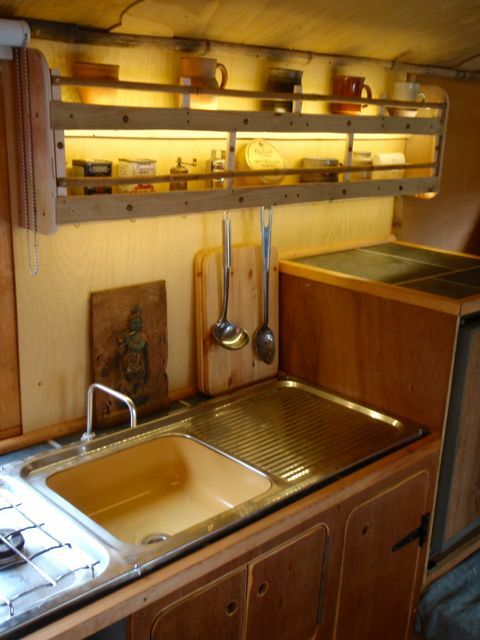 Finally, take a look at a couple pictures of the inside of Matt’s beautiful truck camper. 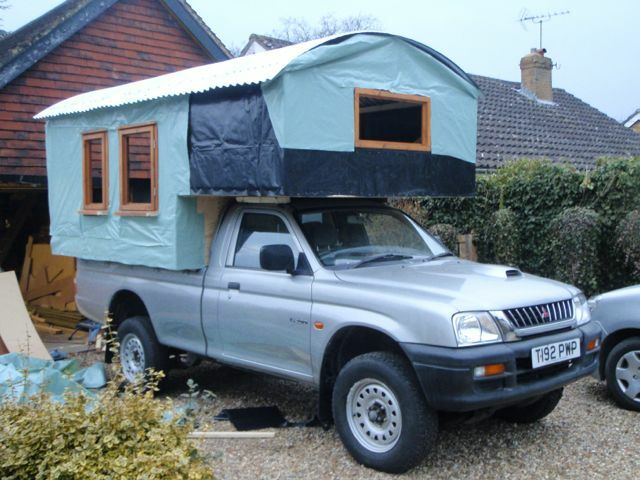 This is one of the most beautiful homemade truck campers I’ve ever seen. And he didn’t even use any plans! For more information or to contact Matt, visit his website here. 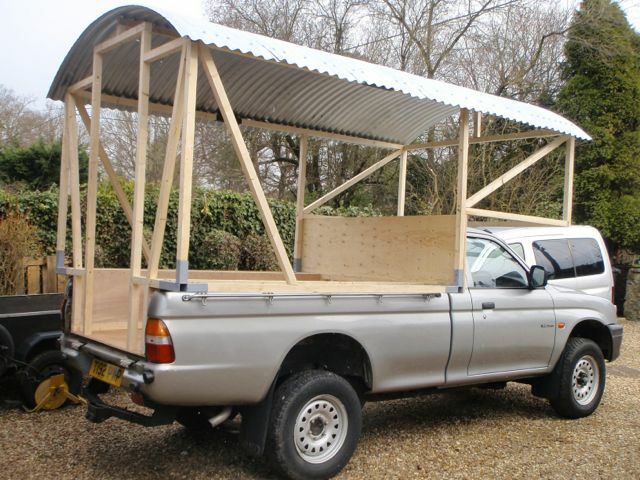 If you liked Matt’s homemade truck camper, you’ll love the DoItYourselfRV Insider’s List. Get free updates, unpublished content, and special offers. Sign up now. No spam. Not ever. 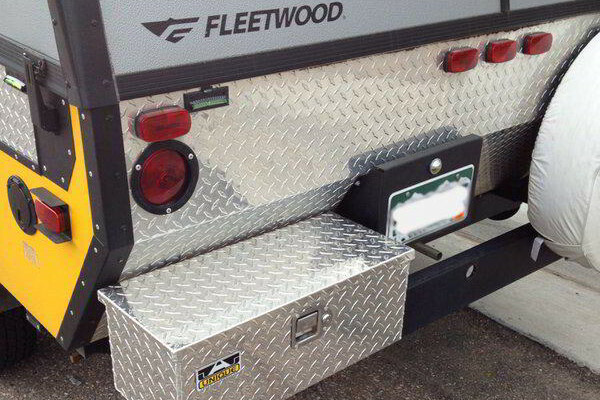 Did you have to use tie downs or was the camper secure in your truck? 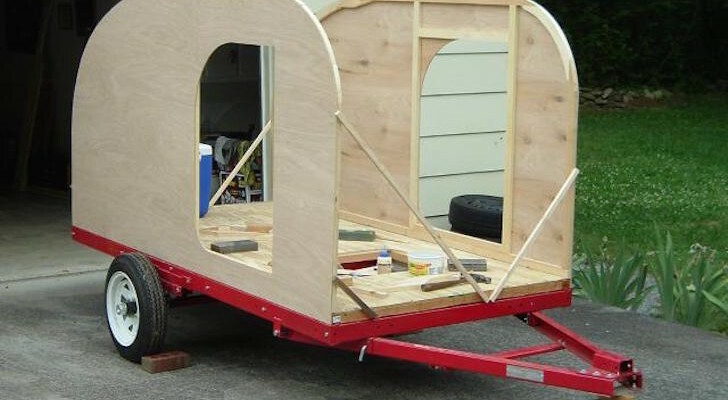 You have inspired me to build one and I’m curious about the tie downs. 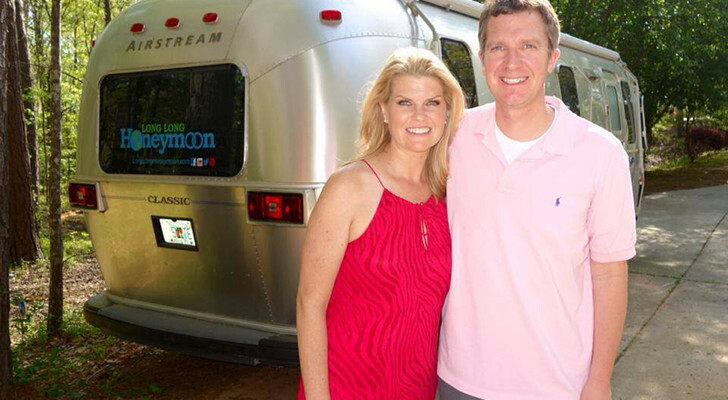 Thanks and great looking camper. I worse than a novice but I really want to do this. 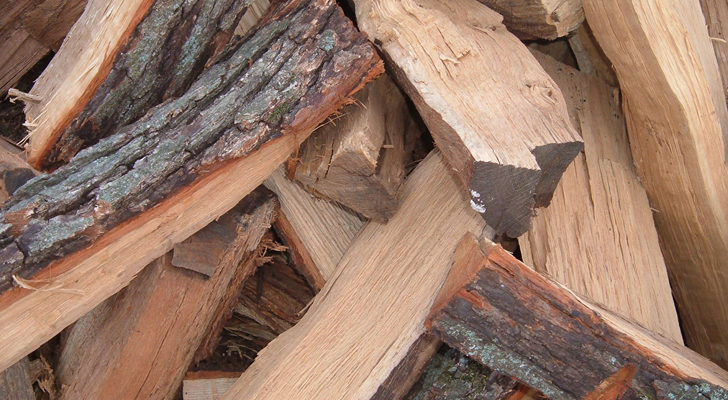 Besides taking a basic woodworking/building class, what should I do to prepare? 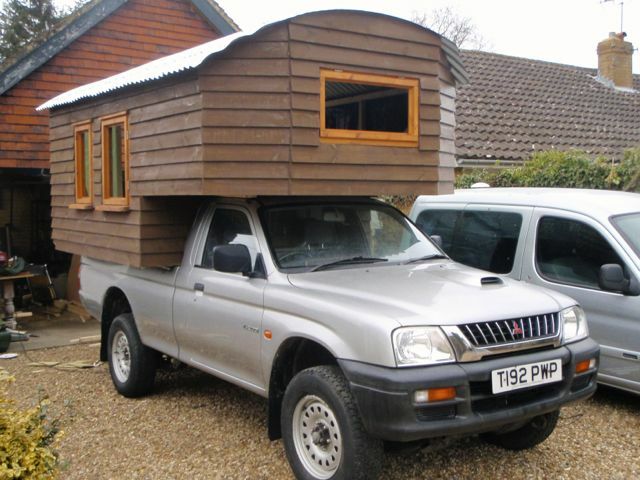 I’m in the process of moving, but once I settle down, I will buy a vehicle…not sure if I want a truck or van. Thoughts? Once I get started I’m planning on taking a year to make it perfect! Thanks very much for the kind words and feedback Doug. Glad you enjoyed it! Matt has a lot of skills, and some other cool projects on his website. 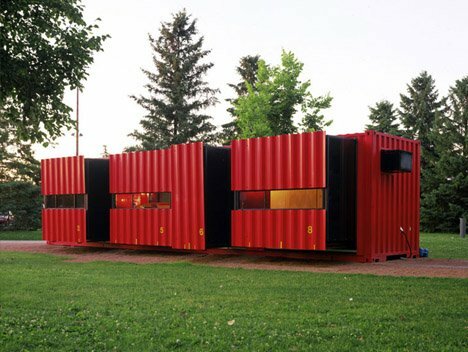 We have such admiration for people with this kind of incredible skill and vision. What a beautiful camper! Thanks for sharing this Eric.